Every aspect of each of our drums is approached with the same question: Is this choice the best one for the intended use of this drum? 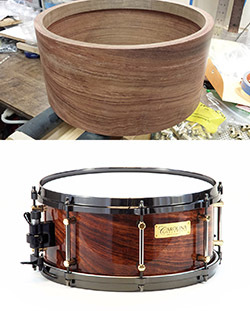 This means not only the best wood configuration and the best hardware; it also means that all the elements, all the parts of the drum are selected to be compatible and working toward the same end result. The bearing edges are suited to the wood and to the nature of the shell. The lugs are suited in weight, materials and dimensions. Click on any of the following features for more information about what goes into a Carolina Drumworks creation.